You might think traditional small businesses fear the "Uber-ization" of the economy. After all, consumers now have a surplus of digital alternatives that provide on-demand products and services at the swipe of a smartphone. How can smaller, more analog enterprises possibly compete with highly nimble, mobile-based, on-demand companies? 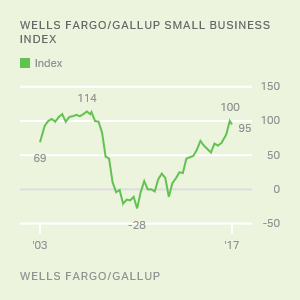 The findings from the most recent Wells Fargo/Gallup Small Business Index survey of small-business owners may surprise you. Almost twice as many owners agreed that the on-demand trend was a benefit (26%) versus a threat (15%) to their small business. Owners might be thinking this way because small businesses are capitalizing on this trend to help run their enterprises. Instead of perceiving these on-demand disruptors as a threat, the survey found that a sizable minority of small-business owners seem to be embracing this trend. Forty-three percent of owners report that they have used services from on-demand companies at some point for their business. Another survey commissioned by UpWork and Freelancers Union, two pro-freelancing organizations, and conducted by Edelman, showed that 73% of freelancers agreed that technology has made it easier to find work. Further, they found that more than half of freelancers have obtained a project online. However, matching businesses to customers is not the only function companies have at their disposal. These on-demand companies now provide small businesses with the latitude and convenience to outsource any number of their business tasks. They can temporarily boost their professional labor force to adjust to customer demand using on-demand job sites. If they need to deliver a product directly to a customer and track that delivery, apps allow them to schedule it on their smartphones. They can also find niche expertise that does not exist in their company like legal counsel or IT specialists. Small businesses that require short-term, specific expertise can now conveniently outsource these services through these digital platforms. The so-called "Uber-economy" represents a category of online- and mobile-based companies that provide on-demand goods, services and labor in business-to-business and business-to-customer relationships. These companies are an element of the broader gig economy, which describes the increased reliance on a contingent, short-term or project-based workforce. Many of these contingent elements of the workforce are based on a small-business model. Even Uber -- a company with a multibillion-dollar valuation -- is based on hundreds of thousands of individual micro or small businesses: the drivers. Additionally, many of these on-demand applications and services are designed specifically for small businesses. There is evidence that this component of the economy is growing. The gig economy is most notably measured by the Bureau of Labor Statistics category of alternative employment arrangements. When alternative work arrangements were recently estimated by economists Lawrence Katz and Alan Krueger, they showed a prominent increase from 10.1% in 2005 to 15.8% in 2015 after years of little change in that metric. Many have pointed to the gig economy as a boon for flexible work schedules, providing some workers with an income flexibly when other employment options are not possible. Others have noted that the gig economy encourages organizations to use contingent work instead of employing salaried workers with benefits. Still, from a big-picture perspective, the on-demand digital marketplace employs a relatively small proportion of the total U.S. workforce. Harris and Krueger (2015) estimated that there were about 600,000 online platform workers in the U.S. who used Uber and other intermediaries to make money. Recent analyses by JPMorgan and McKinsey estimated that between 1% and 4% of the U.S. working population makes money through online platform work. Further, it is not clear whether the competition from these on-demand companies represents a fatal threat to their respective industries. A recent Taxi and Limousine Commission analysis of Uber versus taxi rides in New York City suggested that although Uber represents a smaller market share of NYC ridership, it has had a mixed effect on the ground transportation market. It found that the overall market increased during Uber's rise, but that increase came at the cost of a 14% decrease in taxi ridership. Researchers concluded that more data were necessary to parse out the factors leading to these data trends. Shane McFeely, Ph.D., is a researcher, predictive analytics, at Gallup.